A good true-life story that is worth telling. Machine Gun Preacher is based on the life of Sam Childers, a real-life missionary living in Southern Sudan carrying the word of God in one hand and an AK47 in the other. In the film, Sam Childers is played by Gerard Butler. He is an ex-convict, biker, and heroin addict whose life is on a downward spiral. After a night of robbery and getting high with his best friend Donnie (Michael Shannon), the two have a run in with a psychotic hitchhiker that ends in a stabbing. Sam reaches his personal bottom and with the help of his wife Lynn (Michelle Monaghan) finds God and Christianity. Then after hearing a guest speaker at his church, Sam decides to go an help missionaries in Sudan. While in Africa, he befirends Deng, one of the soldiers who fights against Joseph Kony and his evil reign of terror. Sam convinces him to take him to where the civil war is raging so he can see for himself. While on this weekend trip, Sam encounters some of the horrors that the people of Sudan face at the hands of Joseph Kony and his rebels every day. His personal experiences begin to change him and after a vision from God he decides to build a church back home and an orphanage for the children in Sudan. Machine Gun Preacher not only chronicles the sucesses of Sam Childers and the work he does, but it also documents the struggle Sam encounters in trying to balance the world he knows in Africa with the world he knows less and less in America. Not only does he risk his life to save these children, but he begins to risk his family as well. The film asks the question, "Is Sam saving Africans or are the Africans saving him?" This film is a good one, but hard to watch. Producer-director Marc Forster pulls no punches when it comes to showing the violence of the real-life events that inspired this film. The images are disturbing but evoke a true emotional response. I cried at least four times while I watched the movie. It's one thing to cry because something is staged for emotion. But this film hits on a deeper level because you know these are recreations of moments that Sam Childers actually experienced. Machine Gun Preacher is full of hope and despair and does a pretty good job showing both sides of the Sam Childers struggle. I think i would have like to see more of his movement back to healing in the last quarter of this film. After so much build up and explanation of what causes his change and then his ups and downs, the last part of the film rushes a little and then wraps up a little too quickly for my taste. Often times, films that revolve around faith get a little too preachy or biased. This film is neither. You are defintely aware that Sam Childers is a Christian, but not the kind of Christian most of us have experienced. There is no "Jesus, Jesus, meek and mild" in this movie. The Blu-ray edition of this film comes with three discs. 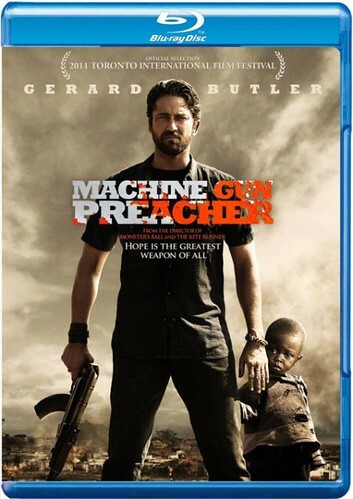 The first disc contains Machine Gun Preacher in High Definition, a discussion with Marc Forster, "Making the Music for Machine Gun Preacher," and the video for "The Keeper" by Chris Cornell. The second disc contains the film on DVD with "Making the Music...". The third disc contains a digital copy of the film for portable media players. Although it is three discs, there are not a lot of extra bells and whistles. It would have been great to include an interview with the actual Sam Childers and I always love to see deleted scens on and disc edition. Overall, I really liked this film. It told a good true-life story that is worth telling. It also reminded me that while I am sitting in my comfortable living room watching a movie, there are people who continue to risk their lives every day in order to protect the lives of those unseen by most of the world.